This weekend I attended the Michigan GT in Lansing, MI. The even has been going on for a number of years but this was only the second year for Bolt Action. There was a great turnout of 24 players (12 Allies and 12 Axis) and from what I saw, all games were Axis versus Allies witch is always great for Bolt Action games. 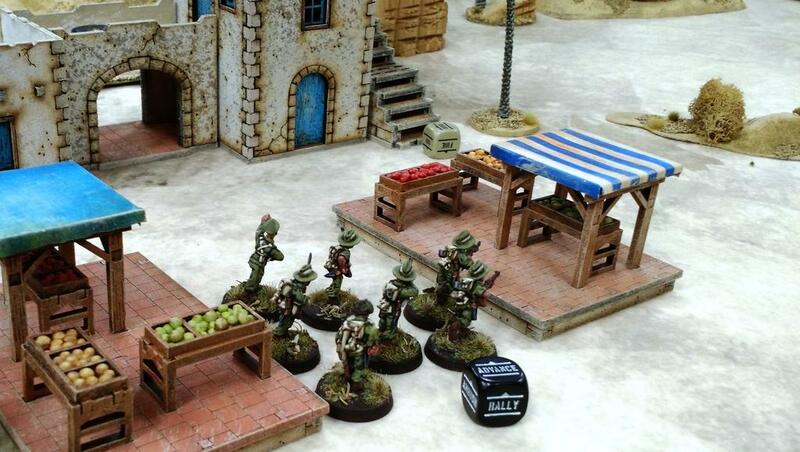 For the 1,000 pt event I brought the British Chindits that I have been working on for the past few months. 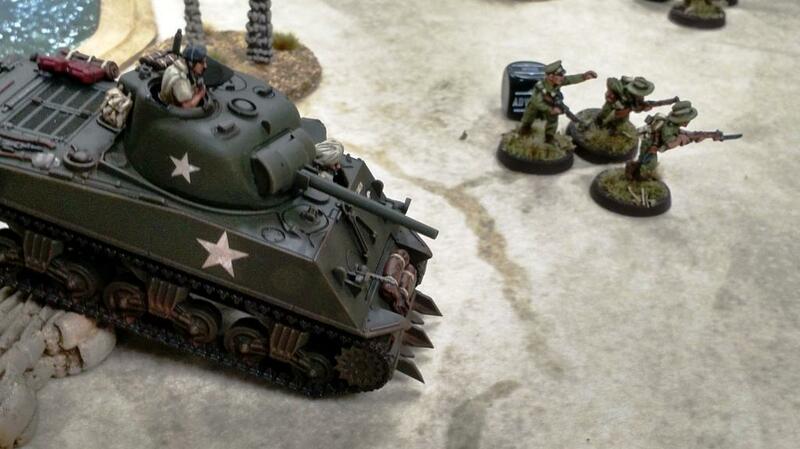 The army contained three rifle squads with a few weapons teams and a 75mm Sherman V for heavy support. The list performed well but with only three infantry squads it struggled to take a hold objectives. With that in mind, I’ll have to make some adjustments for future events. Of course, the issue with the Chindits list in general is how expensive Chindits are. It’s unfortunate that there are no options to take Chindit units as Regular as opposed to only Veteran. 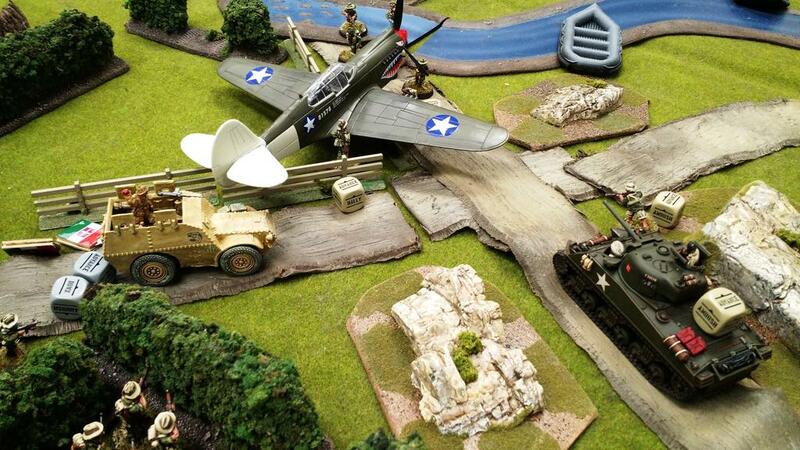 We played three games scenarios were Maximum Attrition, Kittyhawk Down and Point Defense. Honestly, I have never been a fan of Maximum Attrition. The lack of any objective besides destroying your opponent can lead to some very stale games. Luckily, my opponent Dexter and I both decided to meet in the middle and the results were both quick and brutal. 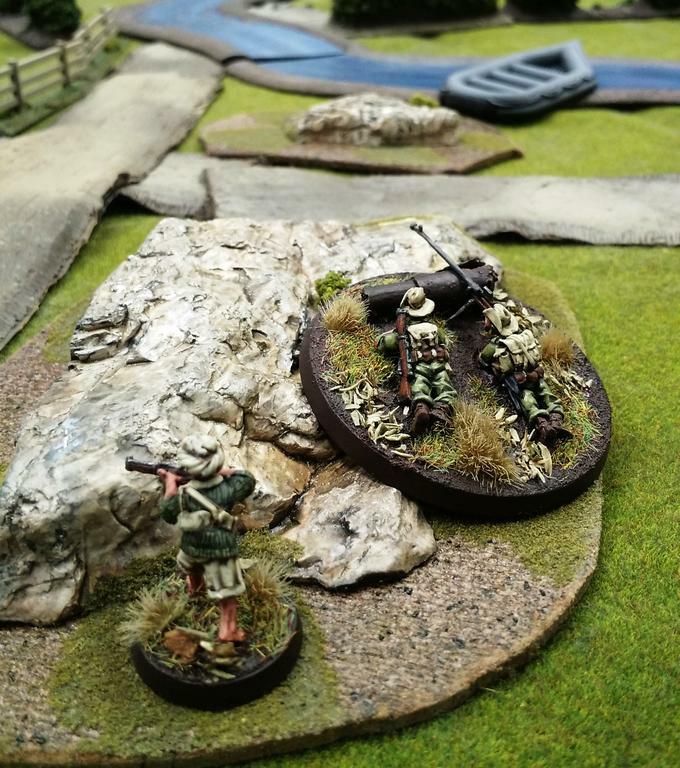 Our game game ended with almost complete destruction of my Chindit force but there were some incredible moments such as my Commando squad rolling a FUBAR and unloading ten shots into a friendly Chindit rile squad. Even with eight hits, no wounds were caused! I guess the Commandos realized there were firing at friendlies. For game two we played one of my favorite scenarios, Kittyhawk Down. The objective, a crashed plan arrives at a random location along the middle line of the table on turn four. During the game the plane crashed right on top of one of Luke’s units and only left one single survivor who passed his moral check despite the four pin markers! He was later killed by the desperate assault from my AT rifle team to capture the objective but he manged to take both of the AT riflemen with him. The game ended as absolute chaos erupted around the objective (pictured above) with units crashing in from all sides and I narrowly snatched a victory. Game three, Point Defense, found my Chindits charging across the desert in an attempt to capture three objectives held by Ed’s Italians. Even with the arrival of late game outflanking Commandos it was not enough to get the Italian force off of the objectives. I ended up going 1-2 at the event and these were some the best games of Bolt Action I have played. It was a great way to say goodbye to the first edition of the game. The next event I’ll be attending, Dragon Fall in St. Charles, IL will be my first second edition event so I have some serious prep to do before the event and get ready for second edition. No event coverage is complete without a look at the winner of Best Painted and Paul’s U.S. Marines army did not disappoint. Paul went all out on the conversions are scenic basing. 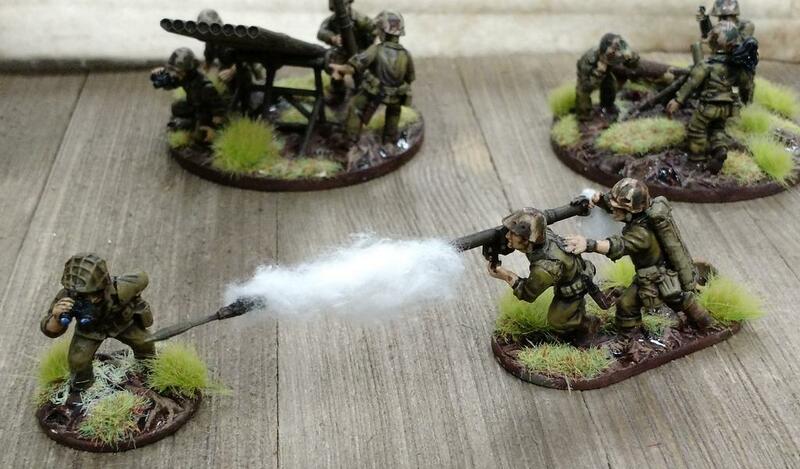 He even included a model P-51 to use when calling in air support.The attention to detail is fanatic and the army includes some impressive conversion work such as the firing bazooka team and the charging marine pictured below. And as it turns out, this army won second place for painting in the overall GT as well! I cannot wait to see Paul’s next project. I did not walk away empty handed either. I can happily say that I won the award for Best Sportsmanship! What more can I ask for from a tournament then three great games against great opponents? Knowing that they had great games too! 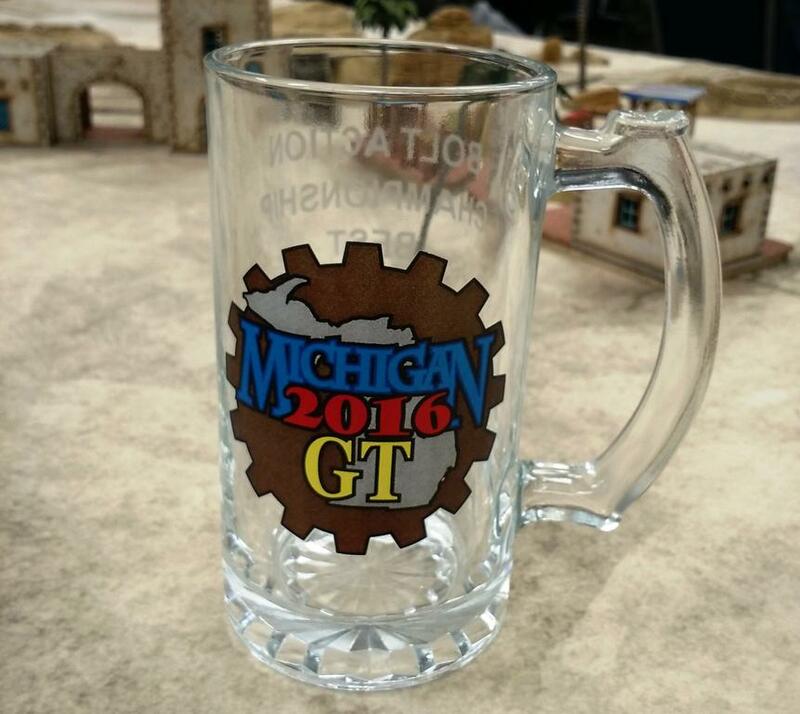 The Michigan GT was a great event and I look forward to attending again in the future. I am already thinking on ideas for a new army and I’ll be gunning for Paul’s best painted award! Oh, I’ll wrap things up with a picture from the 9th Age event. As someone who started Warhammer Fantasy almost 15 years ago it put a smile on my face to see this awesome conversion for a 9th Age army. 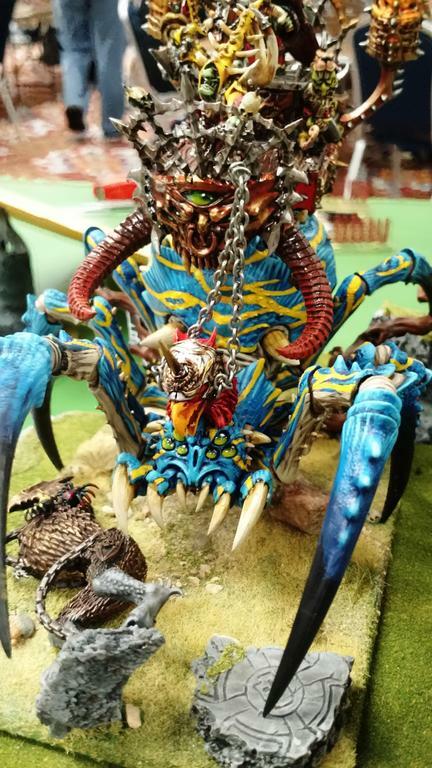 I have no idea what this unit this is but I know an Arachnarok when I see one. Great to see the fantastic Games Workshop Warhammer models still getting love.